On hot days like the ones we’ve been having lately, I prefer to do any cooking that needs to be done early in the morning to save me from heating up the kitchen later in the day. Among my favorite “hot day” dinners are one-dish salad bowls that contain all the elements needed for a satisfying meal. This recipe is adapted from Quick-Fix Vegan. For additional variations, see below. Cook the noodles in a pot of boiling water according to package directions. Drain and run under cold water, then transfer to a large bowl. Add the cabbage, carrot, scallions, cilantro, ginger, and edamame. Set aside. In a small bowl, combine the vinegar, soy sauce, orange juice, vegetable oil, sesame oil, sriracha (if using), sugar, and salt to taste. Stir until well blended. Taste the dressing to make sure it has the desired balance of flavors. Pour the dressing over the noodles and vegetables and toss gently to coat. Taste and adjust the seasoning if needed. Serve at once or cover and refrigerate until needed. If refrigerated, bring it to room temperature before serving and toss again. Sprinkle with peanuts or cashews just before serving. 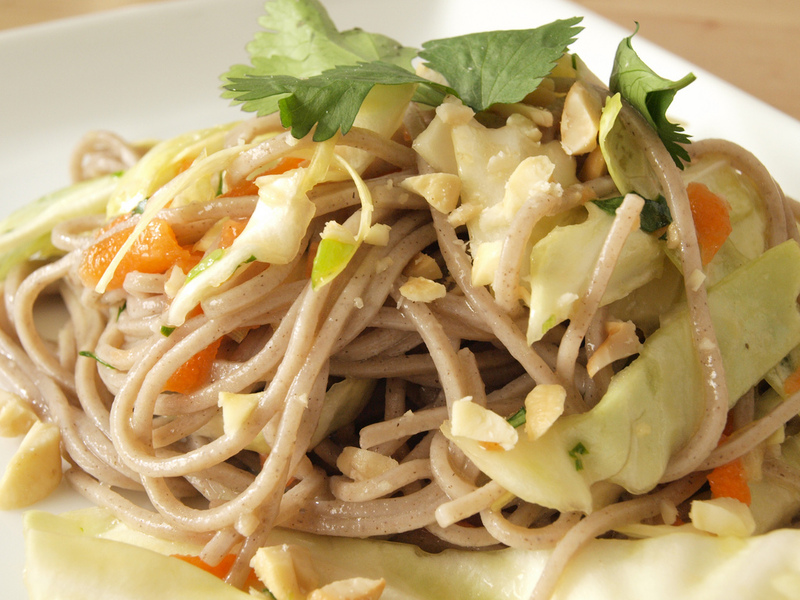 Instead of soba: substitute a few cups of cooked pasta (any kind). You could also use a cooked grain such as brown rice or quinoa instead. Instead of (or in addition to) the slaw: substitute any variety of cooked and/or raw vegetables you may have on hand. To change the flavor: omit the Asian dressing and substitute a garlicky vinaigrette, a pesto dressing, or another type of dressing. Sprinkle with toasted pine nuts or walnuts instead of peanuts or cashews. that sounds so delicious! and you’re right — perfect for a summer day! get it done in the am! I love it too — and the variations are such great ways to use up leftovers! This recipe sounds wonderful, I am going to have to make this tomorrow morning. So I can eat it later in the day. yum, I look forward to trying this. According to my tracking info, my QFV book is waiting for me at home, yay! any substitution suggestions for toasted sesame oil? I know I’m missing some kind of flavor punch by leaving it out, but I’m wondering if anything else can be used? If you want the sesame flavor without the oil, sprinkle the slaw with some toasted sesame seeds. Otherwise, you could simply leave out the sesame oil — it would still taste good.